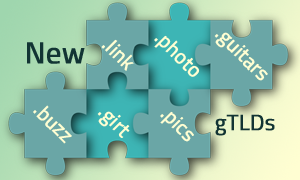 The new gTLDs available for registration by general public include: .LINK, .PHOTO, .PICS, .GIFT, .GUITARS and .BUZZ. Registration of domain names under the above extensions is open to individuals, organizations and businesses on a first-come, first served, non-restricted basis. The new generic Top Level Domains are being released to the Internet within the Internet Corporation for Assigned Names and Numbers developed to increase choice and competition online. There are more and more new gTLDs coming to the Web, so keep an eye on new developments to take advantage of the new online opportunities. To register a domain name under .LINK, .PHOTO, .PICS, .GIFT, .GUITARS or .BUZZ or any other domain, please enter the name in the box or contact our Support Team at support@web-solutions.eu or via phone on +44 (0) 208 133 3994.